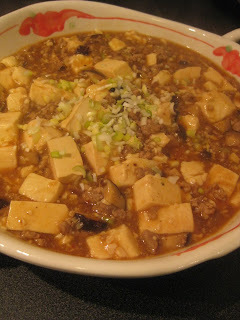 In Japan, Mabo Tofu (or Mapo Tofu in Chinese) is one of the most popular dishes which were adapted from China. I've never really thought of it, but I heard many people make it because it's a budget meal. That's right that it costs so little to make a big bowl of Mabo Tofu. But, to me, I keep making it because of its flavor and texture. This one dish with a bowl of rice can make a complete satisfying meal for me. Cut the tofu into small cubes and blanch in the boiling water for a couple of minutes, then drain. In a wok, saute the garlic, fermented black beans and ginger in the sesame oil for 1 minute at medium-high heat. Add the shiitake and continue to stir for another minutes or until the shiitake is wilted. Add the ground pork and saute until the meat is cooked through. Push the meat to one side of the wok to make a small empty room on the other side of the wok. Add the tobanjan in the empty side and stir only the paste until it's fragrant. Stir-fry the meat and tobanjan together, add the chicken stock and tofu and let it simmer at for 3-4 minutes. Add the sauce mixture and continue to simmer for a couple of more minutes. Add the potato starch-water mixture to the wok and stir well. Garnish with the chopped scallions.